Mashed celeriac is the ultimate Thanksgiving side dish because it is so perfect with turkey and cranberry sauce and marries well with many other flavors. It is also an excellent complement to fish, game, or duck, and works well with lamb tagine or calf’s liver. It is brilliant because it’s so similar to mashed potatoes but more subtle. It’s comforting but also fresh and vibrant. I have to restrain myself from making it too often. The quantity can easily be adapted, with proportions of about 60% – 40% celeriac to potatoes in favor of the celeriac (a lot of celeriac needs to be removed in the peeling process, so it’s always a good idea to buy a bit more than you think you need). Bring two large pots of water to a boil each with 2 Tbsps of coarse sea salt. Peel the celeriac and the potatoes and cut them into large chunks, all about the same size so they take the same amount of time to cook. Place each vegetable in a separate pot of boiling water and cook until soft. **The celeriac and potatoes must be cooked separately because they don’t take the same amount of time to cook through (the celeriac takes longer) and it’s important not to overcook the potatoes; if they start falling apart the consistency of the mash will be watery. ** The cooking time depends on the size of the pieces of vegetable and how crowded they are in the boiling water, but I usually start checking the potatoes by poking them with a sharp knife after about 12 minutes, the celeriac after about 20 minutes. They are ready when the knife goes in with no resistance. Meanwhile, wash the parsley and trim off the thickest part of the stems. 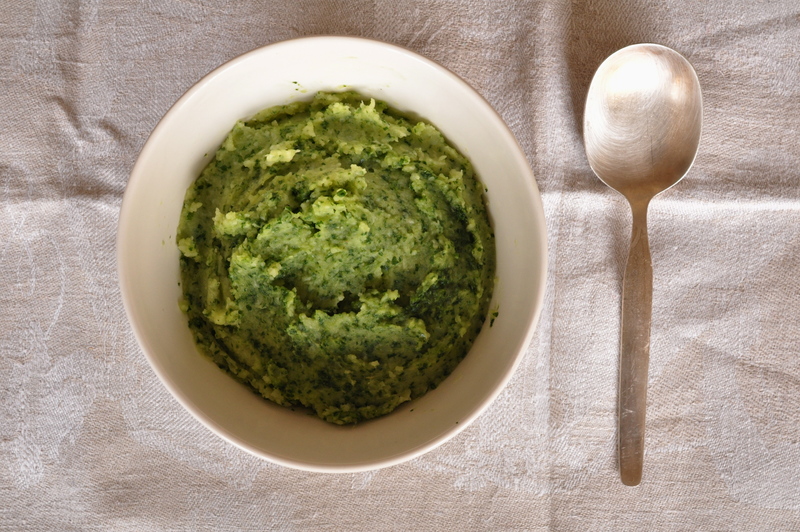 In a blender, purée the parsley with 4 tablespoons of olive oil and 2 tablespoons of water. Once the roots are cooked, mash them with a potato masher or through a food mill (never in a food processor as the blade cutting through the potato starch makes the potatoes gummy). Mix in the butter, a good slosh of olive oil, and season with salt, pepper, and freshly grated nutmeg. Taste and adjust. This entry was posted on 21 November 2011 at 13:40 and is filed under Christmas, Fall, Holidays, Seasonal, Thanksgiving, Winter. You can follow any responses to this entry through the RSS 2.0 feed. You can skip to the end and leave a response. Pinging is currently not allowed. Oohhh, these look lovely. I’ve done a mash of celeriac and potatoes before, but never taken the step of adding parsley (or any other green for that matter). I bet cilantro and basil would be great in this as well. Thanks for the comment, Steve. The idea originated with a meal I had many years ago at 71 Clinton Fresh Food, the restaurant of which Wylie Dufresne was the chef at the time. There was fish over chive mashed potatoes, but not with little bits of chive, they were completely smooth and bright green. Very cool. 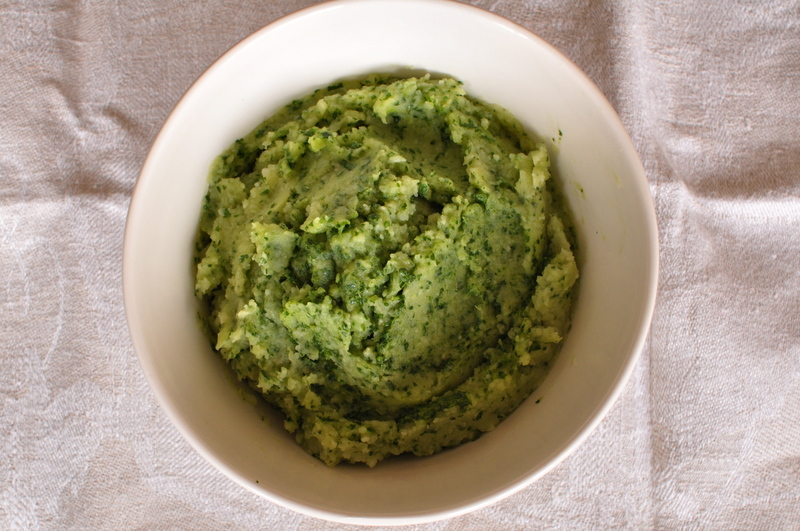 I just love the idea of green mashed potatoes, and I agree, many herbs would be great for this!